Elegance and simplicity brought together in this beautiful Pendant Necklace made from some of the world's most loved precious materials: White Gold, Pearl and Diamond. 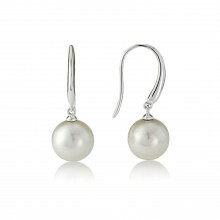 A classic white Pearl hangs from a polished white Gold bale, set with a round Diamond. The Pendant is strung onto a fine white Gold chain which can be worn at 16" or 18".